Raver Tots is a family rave where kids and grownups can hit the dance floor and let off some steam together! 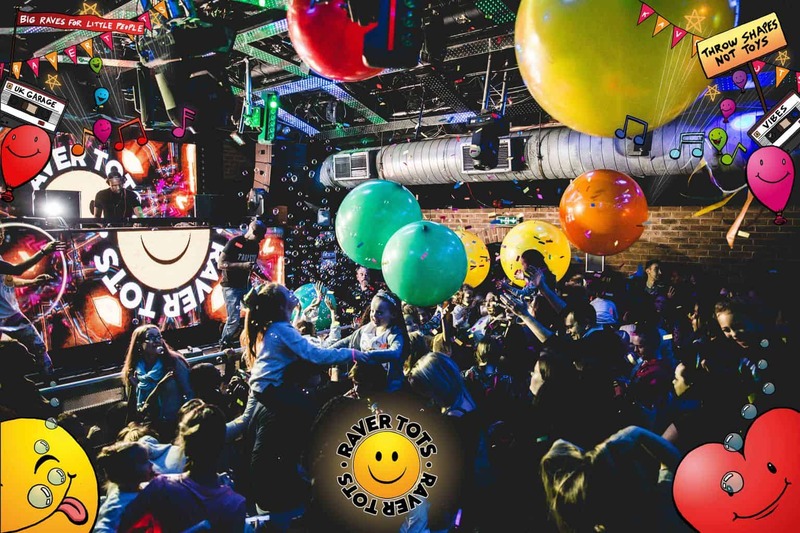 There is tons kids fun including face painting, UV lights, bubbles, balloons, confetti and giant parachutes in a rave style atmosphere with some of the UK’s top DJ’s including residents Artful Dodger, Brandon Block, Slipmatt & Nicky Blackmarket. Some events attract up to 1500 people at a time! With over 8 million views on our videos in the last few months and features on BBC News, Daily Mail & Lad Bible, Raver Tots is widely recognised as the UK’s most popular family event often selling out up to 3 months in advance and with thousands of people in attendance every week around the nation. See the website to find your nearest event. A family ticket gives entry for four people – strictly no adults admitted without a child (maximum of 3 adults to 1 child). Tickets are subject to availability as some events may be sold out. Please note parents remain responsible for children at all times. Children must remain under supervision and we kindly request no running. Tickets are non-refundable and not to be resold. Buggies should be kept in buggy park areas and not taken onto the dance floor as this is a tripping hazard. Buggies parked at own risk. For non-walking babies, baby slings or carriers are advisable. Music is kept at safe levels in line with our risk assessment guidelines. Bring ear defenders if you wish. Expect kid-friendly club lighting in a festival style environment. By attending you give permission for Raver Tots to take photos and videos of the event for the use of press. If you see a photo you wish to have these taken down please contact us via our Facebook page. The prize is for one Family Ticket to a RaverTots event as per the post.